The Castelli Men's Climber's 2.0 Jersey is an incredibly lightweight aero jersey that's made for tackling the mountains on the hottest days. Every winter Castelli goes back to the drawing board to make this jersey lighter, better fitting, or more aerodynamic, then they test it at the Tour Down Under. These jerseys are designed for racing, making no compromises in its quest for superiority. Constructed from lightweight StradaPro 3D polyester and Flusso 4D mesh, this jersey has been made as breathable as possible. These ultra-thin fabrics wick sweat away from the skin and into the air, using perspiration as a cooling agent. Using a similar pattern to their wickedly fast Aero Race line, this jersey tested only 2 watts slower than the Aero Race 5.1 jersey, the most aero jersey they've ever tested. Coming with those aerodynamic gains is a second-skin fit, this jersey hugs every curve of your body to follow your every movement on the bike. 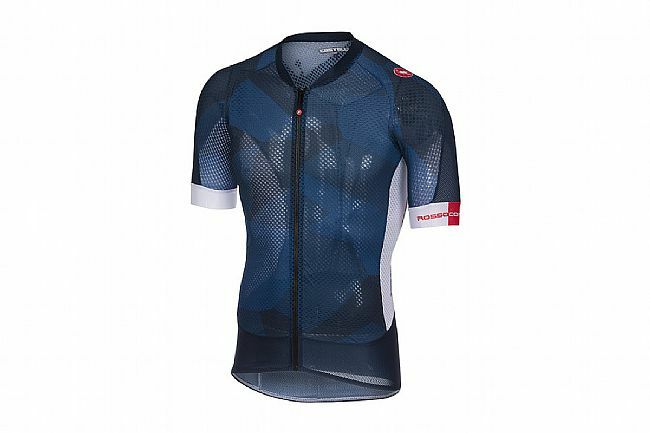 Super lightweight jersey with the same design pattern as the Aero Race 5.1, yet made with featherlight materials. Strada Pro 3D fabric on the back provides support to pockets and UPF 16 protection. 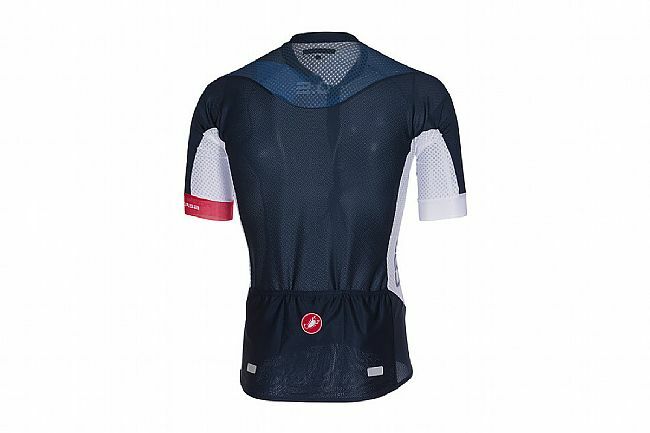 Flusso 3D Fabric on front and shoulders keeps the jersey light and dry. Good jersey at the sale price. I bought it for the exact reasons stated in the description. I live in Arizona and wanted a lite, cool jersey for climbing and just riding in hot weather ( I really don't like climbing). I needed to go up THREE sizes, from a medium to a 2xl. It has very small amount of slack in the chest and waist. (5'11 180lbs., 41 chest, 37 waist and a weight lifter). Those are actual measurements, not the size of cloths I buy. I was shocked by my true waist size since all my purchases are a 32 waist. I wear a medium bike short in PI. I think manufactures are trying to make us feel good about ourselves. Just purchased a Castelli Free Speed Race Jersey in XL. It looks pretty much like it's painted on, but I think I will keep it. Motivation for shedding 5 more pounds.